Although solar batteries and solar storage systems are relatively new, it cannot be denied that they offer a multitude of key benefits and advantages for homeowners. In today’s fast-paced world, daily living expenses can oftentimes go through the roof, and the same is certainly true for energy consumption. However, there are a number of ways you can both lower your energy consumption and maximize energy usage, the most viable of which is by investing in a solar battery backup. Having a solar backup system will open your door to a number of great benefits. Reducing and managing grid cost. If you are connected to a grid, chances are, your expenses will rocket — especially during the summer months. Though you may have had the foresight to be using solar panels, there will still be times when the sun wouldn’t cooperate. A solar battery backup can provide much-needed support to your existing system when energy consumption is at its highest. No grid? No problem! Though they may be few, there are still some homes that aren’t –by choice — connected to the grid. Using solar batteries is a great option as they can help lessen fuel consumption, as well as reduce your carbon footprint. Beat outages. Now, there will be times when an electrical grid falters or fails — most often because of a severe storm or other natural disasters in your area. With a solar panel and solar battery backup in place, your worries can take a back seat. Green Air Has You Covered. Contact Us Today! As one of the Top 500 solar contractors named by Solar Power World magazine, we make it a point to give homeowners some of the finest solar power solutions, including battery backup systems. If this is your first time to use solar power, we will guide you through to a better understanding and appreciation of solar power. 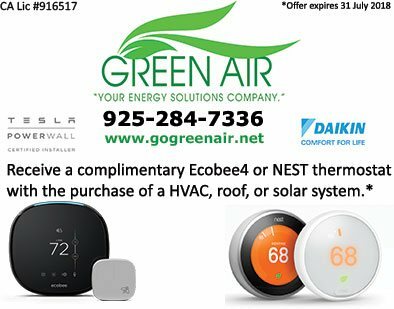 Call Green Air today at (925) 62-SOLAR or (925) 28-GREEN or complete our contact form to receive a free quote. Let us help you take the first step to a greener and more energy efficient home, today!